Looking for places to go, we decided one day to make Ikea Tampines the destination for the day, and what a great choice is was. We discovered that Ikea is really a fun park - with free admission, free rides, and even free parking at Tampines. You only have to pay for food which is quite reasonable! The day started off with a ride on the Spinning Egg Chair. We twirled Ethan around and around and he squealed with laughter so much that Daddy thought he better stop before Ethan may barf! Why is it that kids love getting dizzy? We also played on the Bouncing Air Bags and the Revolving Chairs in the nearby Happy Home Office section. Ethan really enjoyed the Swinging Curtains - so much so that we were even thinking where we could hang this excellent exercise equipment in the house. We then went to the driving circuit where Daddy's vroom vroom sounds completed the effects. It was a very happy time with Daddy as the car seat, engine, and sound-effects rolled into one as Ethan spun his steering wheel. But by far the best time we had at the slides. 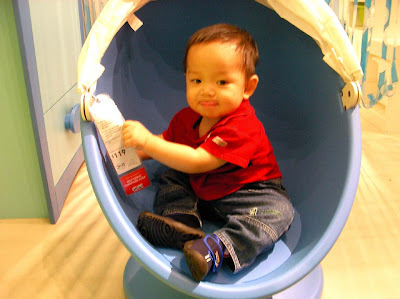 This blog post is quite some time after the actual Ikea day - so we want to note this as Ethan's first time on a slide. I picked him up and put him at the top. He looked down the slide and then up at me very apprehensively. A little guiding push and as Ethan slid down his face changed to unabashed joy and excitement! He screamed with laughter and as he got off the bottom he immediately stretched towards the slide for another around. We must have done the slides close to 20 times that day! 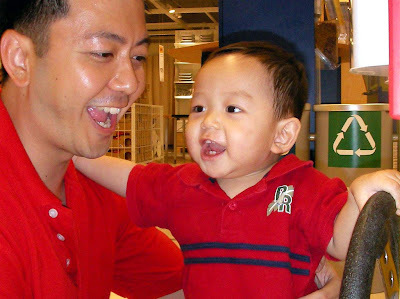 Ethan is hooked and it is extra fun at Ikea cos it is air-conditioned! Here is a video of Mummy bringing him on the slides for the umpteenth time!